The INPUT SELECTOR allows selection of AD-1(OP) or AD-2(OP). 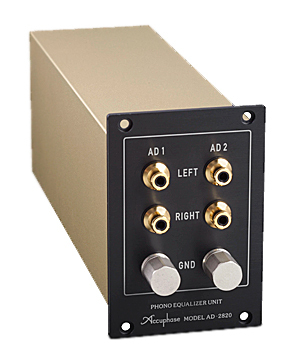 The AD switch allows gain selection of MM 30 dB, MM 40 dB, MC 60 dB, or MC 70 dB. The MC LOAD (OHMS) switch allows setting the MC cartridge load impedance to 10, 30, 100, or 300 ohms. The selected position is stored in an internal memory for each switch. A major feature of the AD-2820 is the use of a balanced configuration for the internal circuitry. Separate input stages optimized for MC and MM cartridges respectively bring out the best performance from every cartridge. When using the MM input, high output impedance matching is achieved by means of a low-noise FET configuration (Q1, Q2, Q3,Q4, Q5, Q6). By contrast, the MC input needs to handle very low-level signals with a low input impedance. This is realized by the use of a differential input circuit with low-noise bipolar transistors (Q7 to Q10) together with a low-impedance NFB loop, resulting in playback with minimal noise. 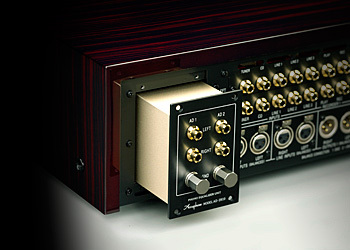 The MC input impedance can be switched to 10, 30, 100, or 300 ohms, while the MM input impedance is fixed to 47 kilohms. 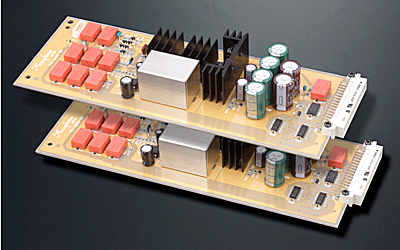 In addition, gain can be set to 60 or 70 dB for MC and to 30 or 40 dB for MM. All of these functions are controlled with switches on the front panel of the host component. Operation convenience therefore is exactly the same as when using a preamplifier with built-in phono equalizer. The AD-290V/AD-290 designed for the C-290V/C-290, as well as the AD-2810/AD-2800 designed for the C-2810/C-2800/C-2410/C-2400 can be used as is in the C-2820. However, selecting the 300 ohm position for the MC impedance will have no effect, because this function is not supported by the older products. Also, the actual gain will be different from the indication of the AD gain selector knob, as follows. MC: 62 dB, 68 dB, MM: 30 dB, 36 dB. The AD-2820 can also be used in the models C-2810/C-2800/C-2410/C-2400/C-290V/C-290. However, the 300 ohm position for the MC impedance cannot be used, because there is no corresponding selector position on the front panel of these models. Also, the actual gain will be different from the indication of the AD gain selector knob, as follows. MC: 60 dB, 70 dB, MM: 30 dB, 40 dB.